I would like to share with you today, a salad dish I frequently prepare. It is simple and very easy to prepare. 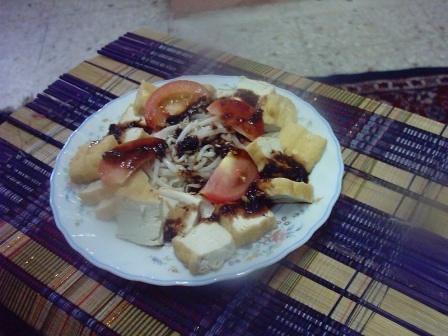 I used to serve this salad with sambal kicap (a pungent soysauce dressing). Pound garlic and chilli until fine. Add in sugar and salt. Just press and rub to crush the sugar. Then mix in the soy sauce. Not too much. Just until it covers the pounded mixture. Squeeze in some lime juice. Arrange the vegetables on a plate and drizzle the sambal kicap just before eating. Garlic is said to be very beneficial to the health. Some research suggests that a daily intake could prevent stomach cancer and influenza. It is also said to reduce cholesterol level. But garlic is also said to trigger migraines and it leaves a bad breath when eaten raw. You can get your supplement of garlic in a tablet. It is recommended you take 2 cloves of raw garlic a day or 4 cloves if cooked.